The year is coming to an end soon and damn, wasn’t that an awesome Linkin Park year? We got a new album, new singles, live shows on several continents and tons of funny online games and events. I’ve asked you on Twitter to describe your favorite Linkin Park moment of 2012 for this special blog post and here are your stories! Organizing an event likes this was a lot of fun, but I didn’t expect so much support – not only from the fans, but also from Mike Shinoda, the Linkin Park PR team (I guess that was Adam), and even Warner, who all spread the news. Sharing the new album with so many fans from all over the world was so amazing that I didn’t want to just stop afterwards. I wanted to stay in contact with the fans and have fun with them. Thus, the LPFC was founded. The concept to not only post news like a billion other fansites, but to dive a bit more into the fandom – interviewing crew members and fans, posting your fanart, fan reviews, etc. – gave me a reason to start my own fansite and I’m very glad I did. I will organize another Listening Party when a new album comes out. I think that could be a really cool tradition. The first webcast with the new amazing set, live tweeting at the same time (how many WWTT did we manage during those 1,5 hours? ), sharing the experience with so many other fans worldwide was just great and it eventually gave me the idea to do the Listening Party. The highlight of my LP existence, so far, was the LP Summit in Dirty Jersey! I don’t belong to any other “fan clubs” but from what I understand- none of them do anything like this- and for that I am grateful! It was super cool that we got to spend the day with other LPU’ers. I think one of my favorite random moments was when “Faint” came on at the Hard Rock during lunch and the energy that instantly appeared from all of us. It could have been louder though. It can always be louder, right? Although, if I have to pinpoint one specific moment, it would have to be LP coming around for autographs at the end of the summit. I have a slight obsession with hearts. They are my favorite. So, of course, I had the nerve to ask these rock guys to each draw a heart in my autograph. I couldn’t help it. In typical/hilarious Joe Hahn fashion- he drew a real heart. Like a real human heart. Perfectly funny! The rest of the guys appeased me though- even though they probably all hated it. There are so many moments from this year- but I think this wins for funniest moment for me. I guess this might be quite an old story type thing to you guys, but for me it’s pretty special. My birthday falls on the first of August, almost a month after Living Things released. I begged my mom for the album but she didn’t like Linkin Park back then and told me I couldn’t have the album because Linkin Park uses a lot of swear words (She likes them now after I made her listen to Powerless, which reminded her of my dad, who passed away). I told her it’s a totally clean album (I found this out from album reviews on the internet) and she told me, “Let’s see.” My friends know I love Linkin Park very, very much. On my birthday, My friends surprised me with the album and a huge card that they’d made. On one page of the card, they made efforts to draw the Minutes to Midnight album cover. My cousin also got me Linkin Park badges for my birthday.These were really special moments for me because people would previously ask me what sort of fan I was if I didn’t even have a single album of theirs. I’d have to reply with, “Having the albums of a band doesn’t define what sort of fan you are,” which is a pretty lame statement. Now I can say, “Yes, I do have one album.” This moment was the most special for me till now. I really hope they come to UAE again so I can meet them, since I missed my last chance. I wrote about a moment I almost missed because of my own stupidity. It all happened on the morning of 05/01/2012. A limited number of free tickets for the Telekom Street Gig in Berlin were available for LPU members. The “sale” started at 10 am on the 1st of May. This should be my first concert as a LPU member, but I needed a ticket. The clock struck 10 am. Let’s do it! I never order a ticket via LPU before. Because of that I took a closer look to the “Event” page of lpunderground.com. A mistake I will never do again. I mean, what’s the problem. Click “Events” search for the right concert and press “order”. The whole searching lasted probably only a few seconds but it felt like hours. And then I saw it “Sold out”!!! Oh no 🙁 I was devastated and angry with myself. Not getting one because I couldn’t find the button. How stupid. People started to post comments like “I won! !” or “I don’t get one” . After 30 minutes I had enough and wanted to turn my pc off. I took a last look and froze in shock. The “order” button was available again. As fast as I could, I pressed the button and prayed for a stable internet connection. Got it!! Got it!! OMG. Best Linkin Park moment in 2012! Why? Winning the ticket leads me to al lot of other unforgettable moments. a) My first trip to Berlin. b) I could spend time with a lot of other fans. c) A concerts in a small venue with an awesome setlist. d) I saw my favorite band live for the third time. e) First concert as a LPU member. What will 2013 year be like? Hopefully as excited as 2012! what a good day to head to Rock im Park and see LINKIN PARK !! Because if it wasn’t for them, we would have never found each other. LP is the reason we’re a couple for 6 years now. time flies! We were lucky to meet LP at the LPU meet&greet. They still recognized us, unbelievable !! We told them it’s our 6th year anniversary today, it seemed like they already knew. So, we were pulled on stage for the ENTIRE show as …well i thought kind of a present. Thanks to Adam and Missy! I didn’t guess in any way what would happen to us. To me. But EVERYBODY including every technician and the band already knew. haha! We had an awesome view across the stage at the back of it. Seeing the crowd from this point of view, how they reacted to LP, was mesmerizing! Adam was staying on stage with us. Chester gave us a hug before he went up on stage. I was clearly confused – they were all so overly kind to us. Beaming with joy all the time! Don’t get me wrong, but this all felt like we all were kinda life long friends to each other. THIS IS INSANE! My boy was having a hard time concentrating on the show while searching for words and prepare for his moment. He’s my hero [ love you forever ♥] !! It takes a lot of courage to ask anyway, but well… in front of 85.000 people ?!?!?! THIS IS CRAZY !!! I still can’t believe LP gave these few minutes of their time on stage to us !!! WE OWE YOU FOR A LIFETIME !! My favourite Linkin Park moment this year has got to be when they came to South Africa for the first time! Camping in line waiting to get golden circle tickets was quite exhilarating! But the best moment is definitely the day I got to meet them! I got an email from Adam the night before the Summit asking me to come and help out and spend the day with Linkin Park. I felt like my heart was exploding with joy! I wasn’t going to let something like final exams or getting permission from my parents stand in my way of going. Days before writing my exams I flew across the country just to spend a few moments with the awesomest people ever! And I don’t regret it for a second. The day was even more brilliant than I thought it would be. Not only did we get to meet them, we also got to play their instruments and so much more! Adam also gave me a Golden Circle ticket to my first Linkin Park concert for helping out 😀 but the highlight was when Chester (my favourite member of the band) threw his guitar pick straight to me! Three days later, I was standing, yet again, in Golden Circle enjoying my second Linkin Park concert! I never expected to see them in my home country and there I got to see them twice! The people that I met at the concerts have since become close friends, brought together by our love for this brilliant band! It truly was the best week of my life! My favourite LP moment in 2012 is their concert in Poland. Before that gig I didn’t know their music well, but then everything changed. I totally fell in love! And all because of my best friend ’cause she really wanted to be there and I wasn’t sure. Now I’m so thankful that she convinced me. I will never forget that night. Today LP are big part of my life, I listen to them every single day and can’t live without them! I hope they will come to my country again and I’m sure I won’t miss it! My special moment of Linkin Park? Haha! You’re joking… Right? You see, even though I didn’t have the pleasure of seeing LP live when they toured South Africa, it doesn’t mean that I can’t have any “special moments” caused by this EPIC band. In fact, those six awesome guys that make up Linkin Park make my whole day special! Everyday! I’ve been a Soldier ever since grade 4. And only because of them, I’ve managed to get through the tough times and heartaches life throws at us everyday. The music from Linkin Park can make me cry, smile, headbang, rock out, and most importantly make me stand up and believe in myself when others put me down. Ever since I heard In The End, I was addicted. I’d play it over and over again. And then… It hit me like a ton of bricks! I suddenly knew that this was THE band that could move me. I would get so emotional when I listen to their songs sometimes. I’d just break down crying. Other times, I’d rap and sing (and occasionally scream) along to the songs until I’d lose my voice. I made it my duty to collect all the albums as physical evidence to show people just how much they mean to me. Since that fateful day in grade 4, there hasn’t been a day I haven’t listened to Linkin Park. Actually as I am typing out this passage, I’m listening to Bleed It Out on repeat! I think I’d probably go insane if I don’t hear any Linkin Park magic for at least once a day. Some may call it an obsession, I call it being loyal. I always imagined what it would be like to meet Mike, Chester, Brad, Joe, Dave and Rob. How cool and warm they would be… If I would faint because of the extreme amount of awesomeness that I would be surrounded by! Only to wake up an hours later with all six of them surrounding my hospital bed with worried expressions on their faces… I think I’d probably end up fainting again. I bet there are thousands of fans like me, dreaming of the day that they’d meet LINKIN PARK. Oh well, a girl can always dream. Anyway, to sum this up, every Linkin Park moment is a very special moment for me. No matter when it happens, where it happens, how it happens, or even why it happens. Hey!! It’s me Alane and I just wanna say that my moment of 2012 was the LPU chat with Mike. It was spamming so bad and it had 3 faces of him!! More like clones. Lol hope this moment was a great moment to you as well. My best moment this year 2012 was the week of 7 Nov to 11 Nov and my friends and I have called it Operation Linkin Park. You see they came to South Africa for the first time and we got to see them live! We were unable to get Golden Circle tickets for our hometown Joburg but we got good seats. But being diehard fans for 12 years we couldn’t accept that. So my best friends and I pooled our resources and planned a trip to Cape Town where we got GC tickets. We rocked out so hard close to the stage in CT and made our way back to Joburg in time to see em live a 2nd time! The JHB crowd vibe was incredible and the whole week blew our minds and touched our souls! I’m an even bigger fan now if you can believe it! I will admit I choked up a lil 😉 jus a little! Haha thanks for ur twitterfeed love it! My favorite favorite Linkin Park moment in 2012 was the concert at Telekom Street Gigs Berlin. First time first row. 2. When Mike was standing on top of a speaker, he looked at me and remembered me, from the LPU Summit in Hamburg 2011 and his smile was soo great! 3. After the show had ended, the band said their thanks to the crowd, Chester and Phoenix went to my side, saw me and remembered me too! 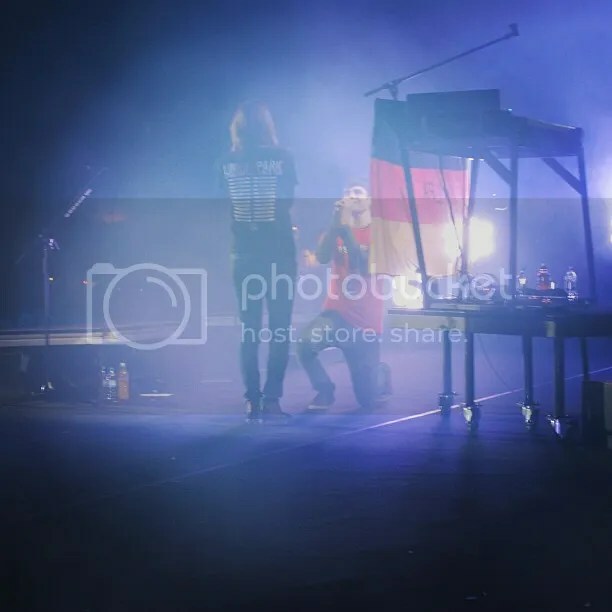 This was my second favorite concert, after the concert at LPU Summit Hamburg 2011. This year I catched a job at a couple of Festivals that I formerly loved to visit. One of them was Rock im Park in Nuremberg/Germany. Knowing that Linkin Park would Headline there, I asked Music for Relief if they needed help at their booth. They greatfully accepted my offer, so everything I had to do was to clear my schedule on Sunday from 3pm to 11pm. That did not quite work out as planned since I had to work from Saturday 9pm to Sunday 2pm (night shift+graveyard shift-whoohoo). When I arrived at the booth I was awake for 30h. I was called being crazy by Missy. Some of you may know Missy – SHE is crazy :D.
Again, I was awake for 30 hours straight, my brain felt like jelly. I stomped into that booth not even recognising Adam (sorry for almost running over you dude). We ran around to raise money and sell Bandanas and Ear Plugs. After a while it started raining, so we took shelter under the tent. with @musikforrielief and @lpunderground @ #rip12. came back to the booth and the water that was on top of the tent just poured down on me. So Chris Cornell was done and my head was screeming for a coffee, and my legs were screaming for rest. 36 hours awake – hold on just a little bit longer. Then quiet, the lights went out, flashing, screaming, the pit went crazy, APFMH hit off, my fatigue was forgotten. I jumped, I sang, I danced. I made my way to the left side of the stage 2 meters away from the barricades. They played all my favourite songs I got more and more excited. And the In the End started, and I was like: NO NO NO! The thing is. At every concert I have been, they played In the End. And at every concert Mike went into MY side of the crowd. I dont long for ripping his arms out or touch his sweaty back so I don’t bother and do my thing.But everyone around me bothers, and who gets hurt? ME! Every single time, I even needed stiches once. So let’s come to what is so special about that show: Bleed it out started and then right when it should go to Sabotage, the band stopped. There they were: Sinead and Richard. And everyone was boo-ing. I yelled at everyone around me to shut the hell up, becaus I wanted to know what he had to say. I knew it had to be something EPIC, otherwise the band would not care to stop the show. So Richard proposed to Sinead and the crowd just went nuts. I’ve never been in such a loud crowd before, crazy. I remember how they started again, Chester messing up Sabotage and Linkin Park pumping up my adrenaline once more with Papercut and One Step Closer and suddenly it was over. I stood there so stunned as the crowd went away. It felt like the whole concert was only 10 minutes long…Rock im Park was over and I could have danced with my favourite band for another 10 hours. I’ve been awake for 38 hours now and I did not bother, it was so amazing like every concert is so amazing. I didn’t think that I would be able to come up with ONE Favorite Linkin Park moment when I’ve had SO MANY that I’m going to shed a tear thinking of the amazing year I’ve had. Having gone to 9 shows within 7 months, I’ve met the most amazing & dedicated soliders, been known around the world for my summit name tag on Sean’s guitar vault, epic pictures, recognized by my shoulder tattoo, or even the fact that I’m a HUGE fan of the bass player. As I sit in my kitchen listening to the DSP from the Camden Show on August 17, 2012 it hit me that this day was absolutely my favorite moment. The day was actually my 5 year wedding anniversary & since the LPU Summit also took place this day, nothing but great things happened on this day. I am so lucky to have been one of the people attend such an intimate experience with the band. Having been one of the first LPUers to interact with Brad’s guitar tech Sean Paden via picture sharing site Instagram, I was excited to meet in person. He made my summer & year a great Linkin Park Experience. I am happy & proud to call him a friend. A part of the summit was the meet & greet with the band. It was a great pleasure to meet Mike, Chester, Rob, & Brad for the first time. I had a photo mat signed by the band members & Mr. Hahn had the first chance at signing & wrote “Happy Anniversary & his usual signature.” Phoenix remembered me as one of his biggest fans. I also made him a little something special & what made this day even more memorable is what he did at the concert later that evening (when the band does their usual goodbyes). He recognized me at the front row & stopped to talk to me. In gestures, he thanked me for his special gift & then congratulated my husband & I on our 5 year anniversary. In about half an hour, Mike himself Retweeted one of my pictures from the show & my phone blew up with notifications from my friends. It was a special moment to me as he only Retweeted 3 people that night. All in all, it was definitely my favorite moment because the day was just MEMORABLE. There were 3 moments I shared with Linkin Park in 2012 that I will never forget. The first was the Living Things listening party on twitter. It was just a night (well it was night here in South Africa) of absolute connection. I was alone with my calculus textbook, my itunes and my twitter but I felt like I was surrounded by the entire LP community. And with some of the band members live tweeting with us, it was just an incredible way to appreciate the brilliant album they gifted us with. The second was at the Cape Town LPU Summit. We had just had the best day thus far, hung out on Linkin Park’s stage. Stood where Mike, Joe, Chester, Rob, Brad and Phoenix stood. It was pure bliss. But that wasn’t my favourite moment. Mine was when they actually entered the room that we were waiting in. It was surreal. These 6 icons making their way towards us. It didn’t feel like us though, it felt like just me, and them, and this moment I had dreamt about for so long, this moment I never thought would ever come true. The last was at the Johannesburg concert. It was electric. There was an energy in the stadium between the 60000+ fans and the band that I just can’t put into words. I will never forget the thousand of voices singing in unison, the silence between Chester’s notes in Waiting For The End, the galaxy of stars that erupted during Shadow of the Day. You could tell that the night was as incredible for the band as it was for us. The goosebumps still haven’t gone away. I might have overshot it with this submission, but there’s never enough with this band. I want to thank them, and my fellow Linkin Park fans for an unbelievable 2012! As you may know, there wasn’t much Linkin Park in Germany this year, but there are like 3 big things for me. First of all: My flag.. But it doesn’t only make one thing.. it makes too. It wasn’t only up on stage at Rock am Ring, but at Rock im Park too. The next one was the Telekom Street Gig in Berlin, where it was kinda the only chance ever for me to see Linkin Park in a small venue again and I went there.. And the last? The new album + everything that stands in connection with that. My favourite LP moment of 2012 was the Scavenger Hunt – a perfect way to open the world of adventure and the unknown for others abroad. It united a worldwide fan base based on clues that were set out all over the world. It started in Sydney Australia with a Mike viddy message of Mannings Bar on the grounds of the University of Sydney at 2 am, while we Australians slept only to be woken to something that was huge, speaking world wide scale (best quote from the LPA thread “Why do Australians sleep?”). The expedition carried a few fun filled and hilarious voyages, (cough Canada with the homeless guy cough) and ended with a Zane Lowe interview in London, England to reveal LIES GREED MISERY leak that Mike himself encouraged. In my media relation view, this was the best way to get fans involved for a promotion for their new album LIVING THINGS (#ALLCAPSEVERYTHING). People scoured not only on foot, but on the internet for information that could get them to the next clue to help their fanbase out. A well deserved recognition came to those who participated on foot, with a hand burned and signed copy of LIES GREED MISERY to each. This hunt was not in vain at all for everyone was rewarded in one form or another with new friendships established across the fan base (well for me at least) and the proven determination to work as a team. What’s your favorite Linkin Park moment in 2012? This entry was posted in Contests, Fan Art, Fan Reviews, Fan Stories, Fun, Honda Civic Tour, Interviews, Live, LIVING THINGS World Tour 2012, LP Underground, Music, Music For Relief, News, Pictures, Promotion, Videos and tag linkin park, living things, mike shinoda, music. my best moment of 12 with lp would be buying living things album and getting the a months membership! had lovely time with lp!